Dr. Jessica L. Ambler holds a Ph.D. from the University of California, Santa Barbara with a specialization is Roman architecture. She was a Post-Doctoral Research Fellow at UCSB and a Curatorial Assistant at the Santa Barbara Museum of Art. She now teaches Humanities online for Southern New Hampshire University. 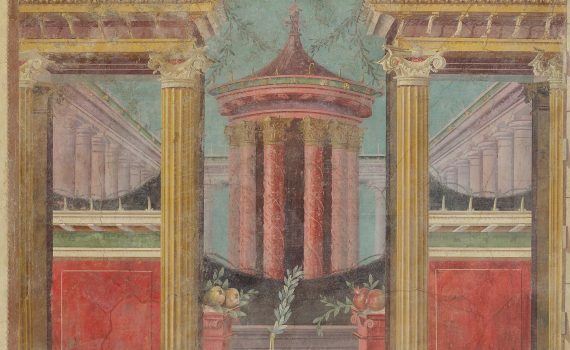 Mount Vesuvius buried Pompeii two millennia ago—creating a time capsule of the evolution of Roman painting. Concrete, arches, and vaulting allowed the Roman Empire to become an engineering and architectural marvel. With the lands of Greece, Egypt, and beyond, Ancient Rome was a melting pot of cultures.